A superb, south facing three bedroom apartment situated on the second floor of this exclusive development. Enjoying far reaching views across the river, residents golf course and countryside beyond; 8 Capplebarrow is situated on the sought after Cowan Head development at the entrance to the Lake District National Park and offers a fantastic opportunity as either a permanent or second home. The apartment itself is both practical and attractive with open plan reception space complete with stunning dual aspect and glass balcony running to two sides, a stylish modern kitchen, two double bedrooms, one of which is en-suite, a single bedroom and a generous house bathroom. There is plenty of storage and even a practical, private entrance vestibule. Capplebarrow also benefits from both stair and lift access. Set in 47 acres on either side of the River Kent the residents of Cowan Head enjoy the benefits of private riverbank fishing for brown trout and salmon in the season, an indoor swimming pool with Jacuzzi, sauna and steam room together with a delightful 9 hole, well maintained golf course. The Cowan Head development is very well managed and offers a high level of privacy and security, only a few minutes drive from the busy honey pot of Bowness on Windermere and all the central Lake District has to offer; the bustling market town of Kendal with its extensive amenities and which has a West Coast main line rail service that provides access to London in 2 ½ hours is within a 4 mile drive and Junction 36 of the M6 is less than a 15 minute drive. Privacy is maintained with the development being for the exclusive use of residents and a restriction against holiday letting's is in place. Accommodation 9'9 x 7'7 (2.98 x 2.31) A spacious and welcoming private vestibule with tiled flooring provides a practical entrance to this modern, well presented apartment. A timber door then leads into the inner hall providing access to throughout the apartment and also a useful storage cupboard. Open Plan Living Space 20'7 x 17'2 (6.28 x 5.23) The spacious L shaped room is lovely and bright and enjoys a marvellous dual aspect with stunning views across the surrounding countryside. Sliding doors lead out on to the glazed balcony that wraps around the building and provides ample space for al fresco dining. Kitchen 10'4 x 8'10 (3.15 x 2.68) The kitchen has been recently updated and offers a good range of wall and base units in a white gloss finish encompassing integrated electric oven, microwave, electric hob, fridge, freezer, washing machine and dishwasher. In addition the stainless steel sink and a half with drainer has a spectacular easterly outlook across the golf course. 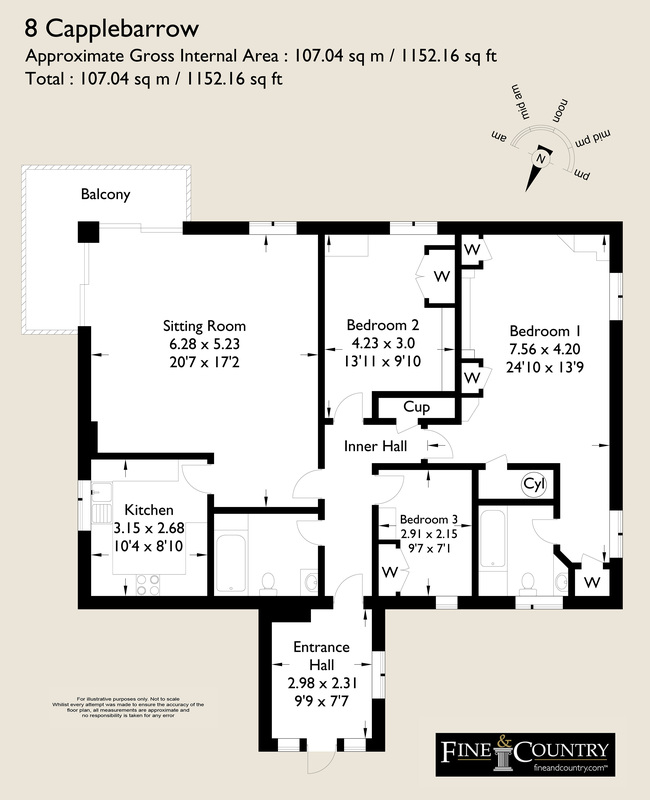 Master Bedroom 24'10 x 13'9 (7.56 x 4.20) A spacious double bedroom benefiting from a good range of fitted furniture, a quiet courtyard outlook and two additional integrated store cupboards/wardrobes. The en-suite bathroom is bright and spacious; comprising a three piece, modern white suite of vanity wash hand basin, panel bath with bespoke, folding shower screen and crystal effect rain shower, WC and heated towel radiator. Tiled throughout in a crisp white finish. Bedroom 2 13'11 x 9'10 (4.23 x 3.0) Enjoying superb views, this double guest bedroom is well proportioned and has a range of fitted furniture including wardrobe, overhead storage and dressing table. Bedroom 3 9'7 x 7'1 (2.91 x 2.15) A super single bedroom with fitted wardrobes and dressing table, ideal as a bedroom or study. Shower Room This generous facility is fully tiled in a neutral style with large corner shower cubicle, vanity wash hand basin and fitted mirror, WC and heated towel radiator. Outside One private outside parking space, a single garage parking space and additional unassigned spaces for Visitors' cars are available. There is also a useful store room in the basement ideal for outdoor equipment, golf clubs, barbecues and the like. 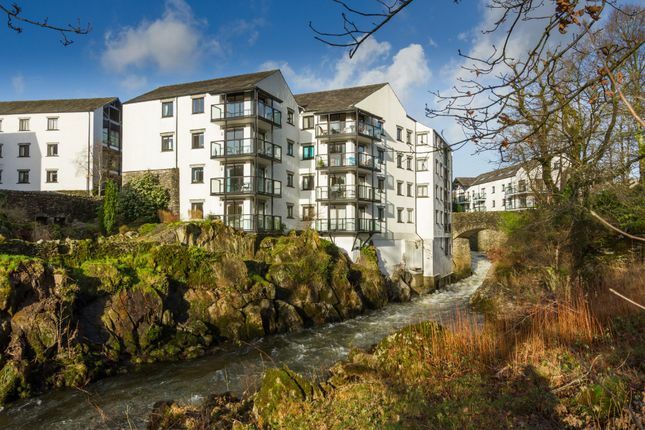 The setting could not be more picturesque, stunning views up the majestic Kentmere Valley and over the River Kent make this the ideal bolt hole in the Lakes. The grounds surrounding Cowan Head are extensive and free to roam for residents, and 8 Capplebarrow allows one dog, so the 47 acre estate is ideal for walking with or without your four legged friend! The leisure facilities are superb; with swimming pool, steam room and sauna available exclusively for residents. Tenure Long leasehold for the balance of a 999 year lease. The freehold is vested in the Management Company, each resident being a shareholder in that company. An annual service charge for full maintenance of the development including lifts, heating and cleaning of common parts, leisure facilities, gardens and ground keeping and buildings insurance is £995 per quarter. Directions From M6 J36 follow the main A591 following signs for Windermere at the Plumbgarths Roundabout. Continue along the small dual carriageway and as the road drops down the hill pass the filling station on the right and take the first right turning signposted Burneside and Cowan Head. Follow the road for approx. ¾ of a mile and turn left at the Cowan Head signpost.